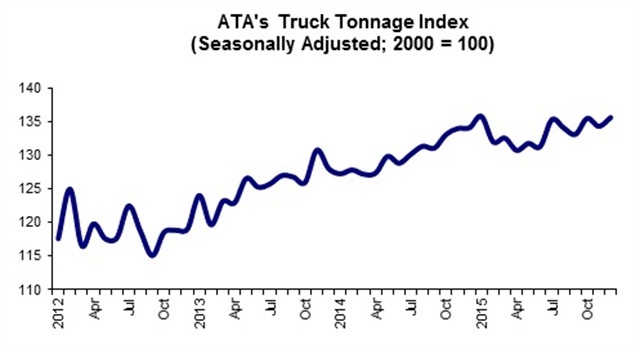 American Trucking Associations’ advanced seasonally adjusted For-Hire Truck Tonnage Index increased 1% in December, ending the year on a strong note. Following a decrease of 0.9% during November, the index equaled 135.6. That's up from 134.3 in the previous month and just 0.1% below the all-time high of 135.8 reached in January 2015. The not seasonally adjusted index, which represents the change in tonnage actually hauled by the fleets before any seasonal adjustment, equaled 132.7 in December, which was 2.9% above the previous month. Compared with December 2014, the seasonally adjusted index increased 1.1%, which was better than November’s 0.2% year-over-year gain. For all of 2015, tonnage was up 2.6%. High inventory levels throughout the supply chain remain a concern, with a large gap between inventory and sales.